Stitchin' Bints: Will This Sweater Never End? I have been working on this sweater on and off for at least a year and a half. I started it with such good intentions, but because of the nature of the pattern, it takes so long just to finish an inch of knitting, I could make a meal for ten in the same length of time, AND drive cross country. 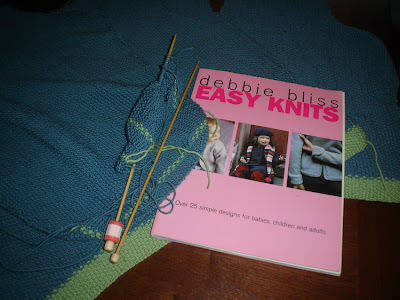 The pattern is from Easy Knits by Debby Bliss, and it is truly easy. It requires a great deal of patience, though, which I have only in short supply. 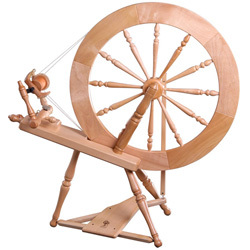 The yarn is a thin soft wool/cotton that uses No. 10/US 3 size needles. Also, because it is done in a moss stitch, each row nestles in on the one before it. I finished the back and half of the front last year and then put it all away in disgust. But now I have dragged it out of the bag again, and just yesterday finished a sleeve. One more sleeve to go, and then the assembly. I do hope I like the thing when it's finished. In the States, this project, including the book of patterns, would cost approximately $125. I actually got it as part of a barter--I manned my friend's yarn store for a couple of days while she was out of town. Quite a marathon project! I hope that posting it here will give you the incentive to continue. I've found that 'little and often' does produce results! Moss stitch is a great-looking stitch, but I find it takes more concentration - you can't 'switch off' quite so easily. The baby jacket (which I'm hopefully about to post) has double moss stitch detail - it's so easy to get out of step and not notice for a couple of rows!